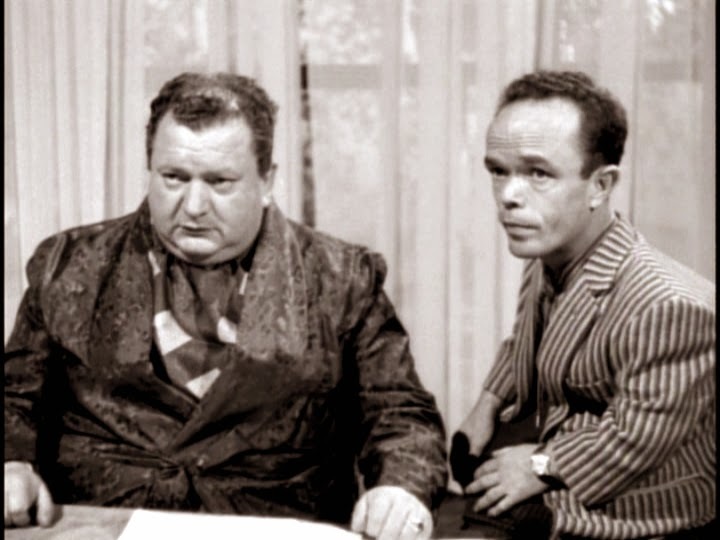 The Short Version: After battling zombies, Santo tackles more down-to-earth opponents in the rotund gangster Don Cosme and his gambling syndicate. 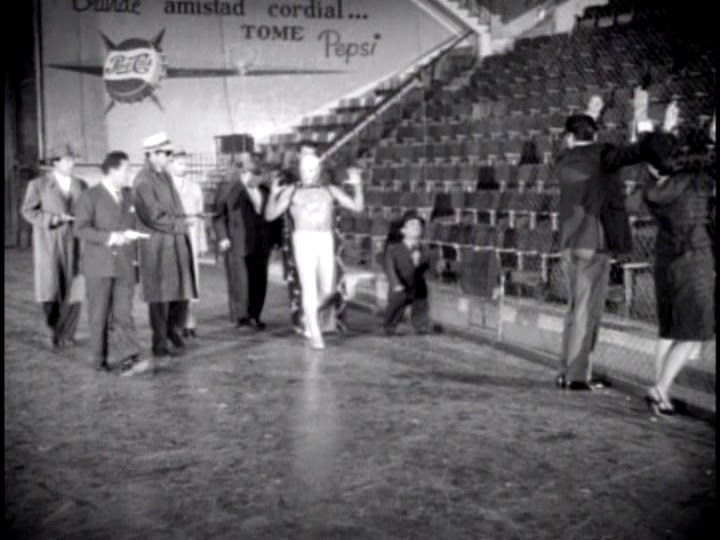 In between wrestling bouts more heated than normally seen, the busy Santo finds time to play a bit of Jai Alai to trap Cosme and his men. 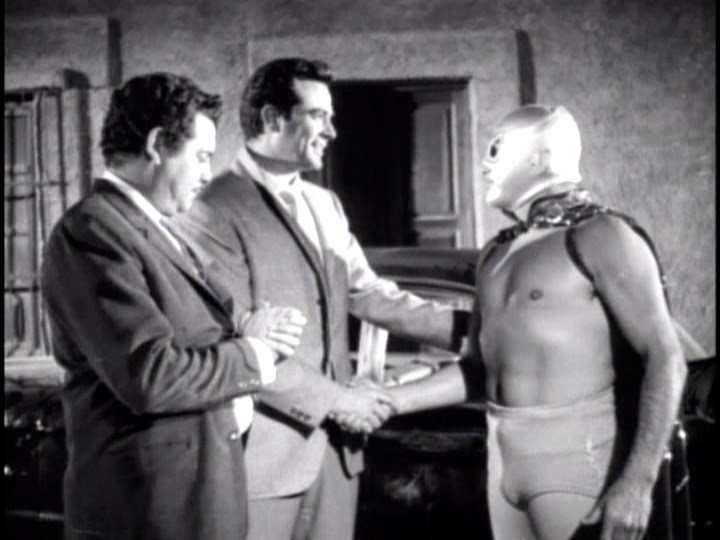 The real fascination with this early entry in the long running Santo series is that the Silver Masked One is given an origin, and a Batman styled persona replete with a big mansion, a caretaker, and a secret lab completing his superhero ensemble. A monsterless movie, KING OF CRIME is kinda talky, but kinda fun. Recommended for serious Santo fans. Standing up to bullies to protect a little girl and her puppy, the young Beto de la Llata's valiance makes his father proud. This prompts the patriarch to reveal to his young son that his former identity was that of Santo, a protector of the people from the forces of evil that has been a family tradition for decades. 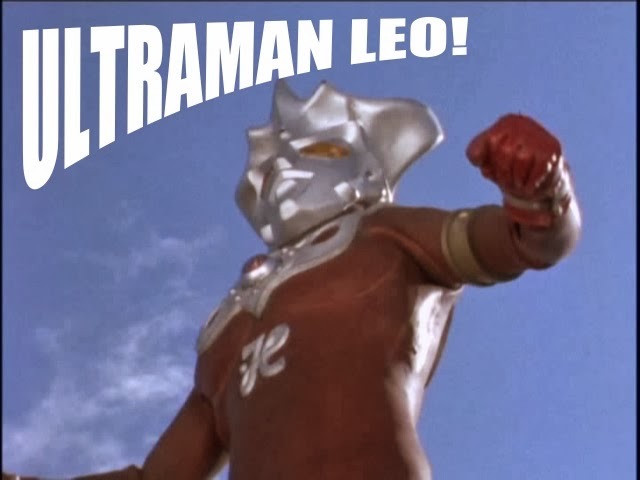 Entrusting his son to one day don the silver mask, upon winning Mexico's coveted wrestling championship belt, Roberto unsheathes his father's silver mask, ready to battle criminality. 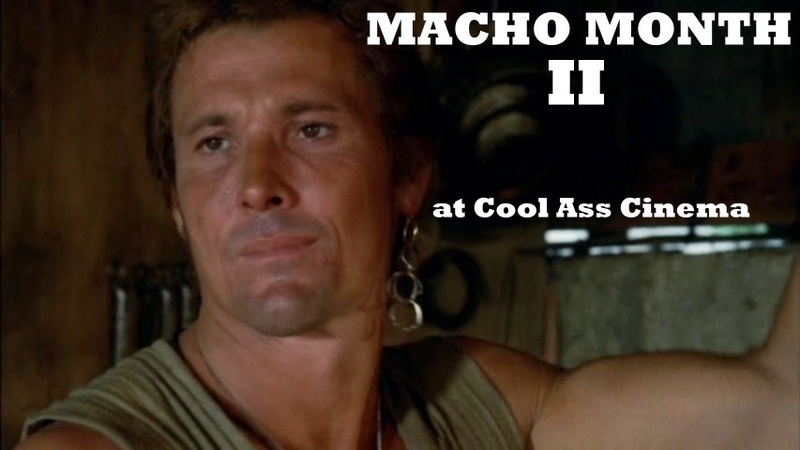 His first task is to bring a ruthless gangster syndicate to justice. This Santo adventure is the first of a crime caper trilogy filmed in between SANTO VS. THE ZOMBIES (1962) and the cult favorite SANTO VS. THE VAMPIRE WOMEN (1962) from Federico Curiel and the Peliculas Rodriguez production company in 1961. The other two films being SANTO EN EL HOTEL DE LA MUERTA (SANTO IN THE HOTEL OF DEATH) and SANTO CONTRA EL CEREBRO DIABOLICO (SANTO VS. THE DIABOLICAL BRAIN). 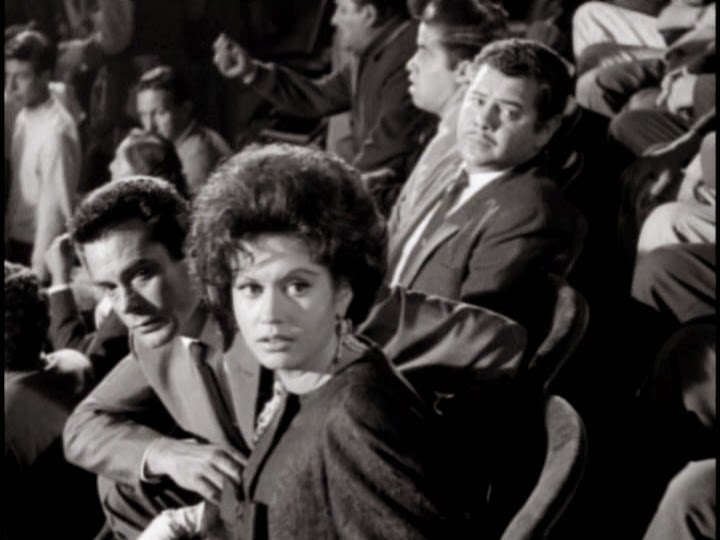 All three starred Fernando Casanova, Ana Bertha Lepe, and Beto el Boticario as Santo's detective colleagues. Curiel, no stranger to Santo cinema and Mexi-horror in general, wrote the script, and keeps things moving for the most part. The film falters here and there, and the editing could definitely use some tightening up, but the air of a superhero movie is palpable throughout. 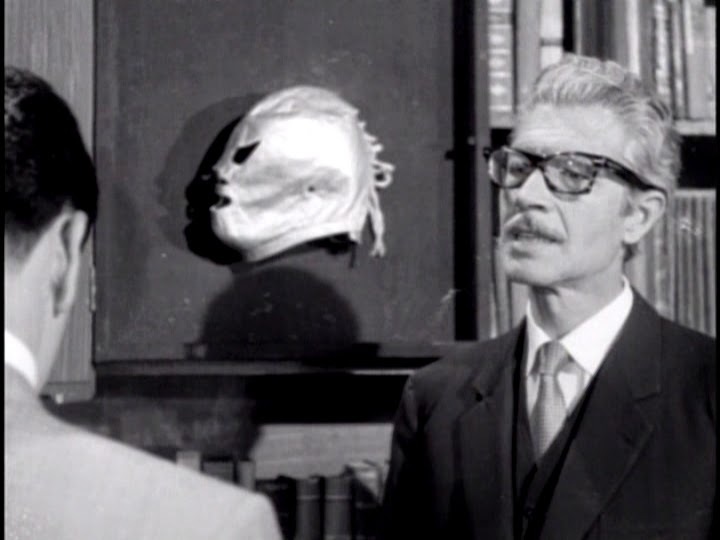 This is most indicative in that Santo is given an origin story (his first movie, SANTO CONTRA CEREBRO DEL MAL, didn't give him one); we're even given a glimpse of his face, so to speak. 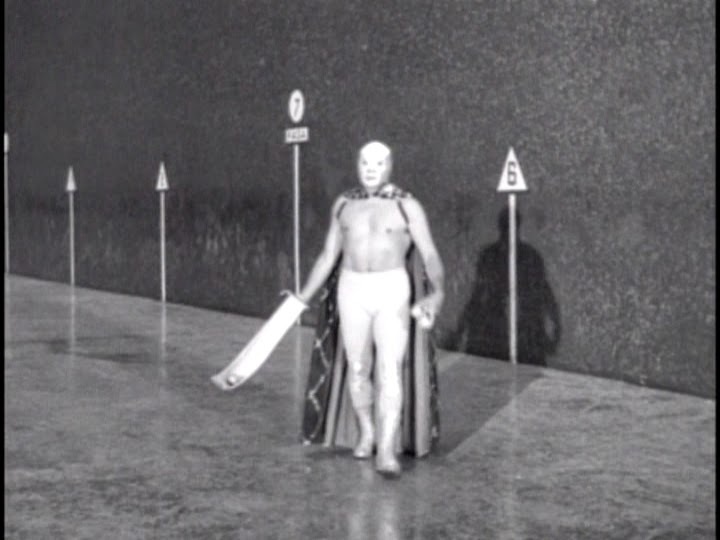 A similar stunt is pulled in the Santo film EL HACHA DIABOLICA (1965). 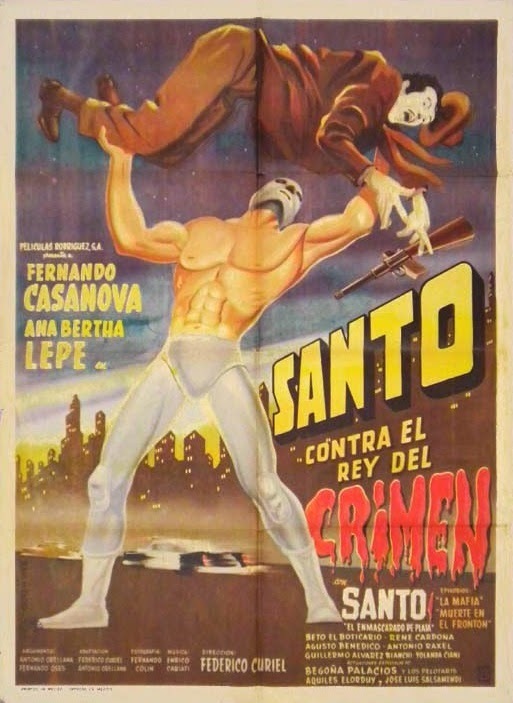 What's interesting about this origin is that, unlike other movies, Santo is the alter ego of wrestler, Roberto de la Llata; his "mysterious disappearance" prompting the emergence of the Saintly One, leaving his life as his former self behind. Famous director of trashy, yet highly entertaining movies, Rene Cardona plays the father of the young man who would be Santo -- in fact, the father WAS Santo, but debilitating health led to his hanging up the mask. His son takes up the mantle of savior of the people to battle evil wherever it may reside. The evil in this case is the title King of Crime. And this Mexican kingpin is a portly, multi-lingual fellow who runs a gambling racket fixing sporting events in both wrestling and Jai Alai (a sport akin to Handball, or Tennis) from half a dozen phones on his desk. Speaking of which, there's quite a bit of sporting event footage in this one. 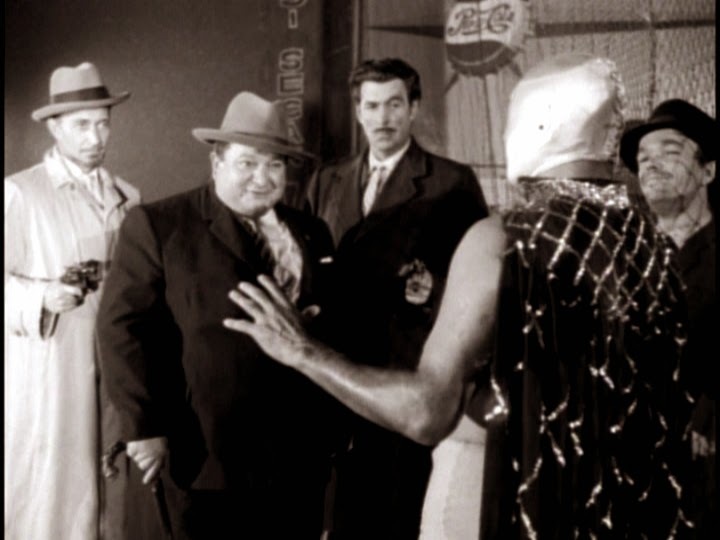 Most Santo movies contain at least two wrestling matches (some have none at all), and this one has two, plus a few segments of the main characters attending Jai Alai events. Santo even participates in a game; or more precisely, a player of a much smaller build wearing his mask. These scenes are integral to the story, mind you; and while they may feel like there only purpose is to pad out the running time, these scenes are interesting to see how this sport is played. The attempt at building an arc around the two detectives and the feisty female reporter is a nice touch, and rare for these films. Some of it is unnecessary and out of place (where is the editor? ), but it does aid in accentuating Santo's scenes when he shows up out of nowhere to save our intrepid trio of investigators. Enrico Cabiati's jazzy score is atypical of these movies, although some Santo films have genuinely attractive soundtracks; mostly for the entries with fantastical elements, which doesn't apply here. 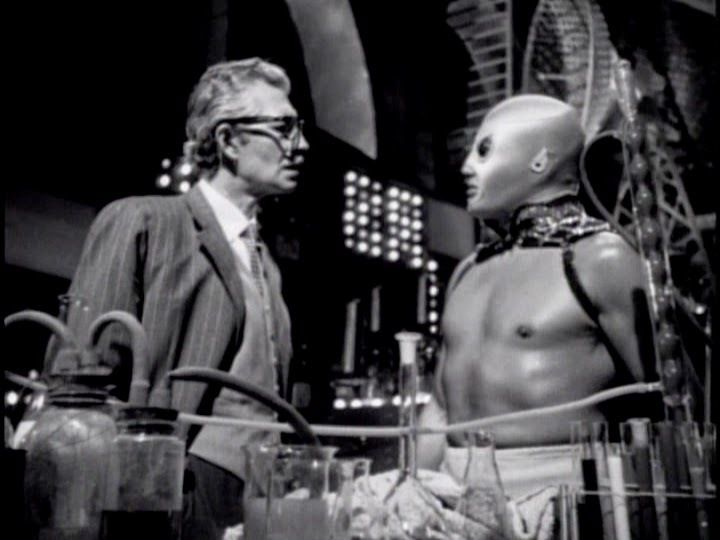 The most popular Santo movies are the ones where he battles mad scientists and monsters, and while there's none of that here, some minor SciSpy concepts shine through. 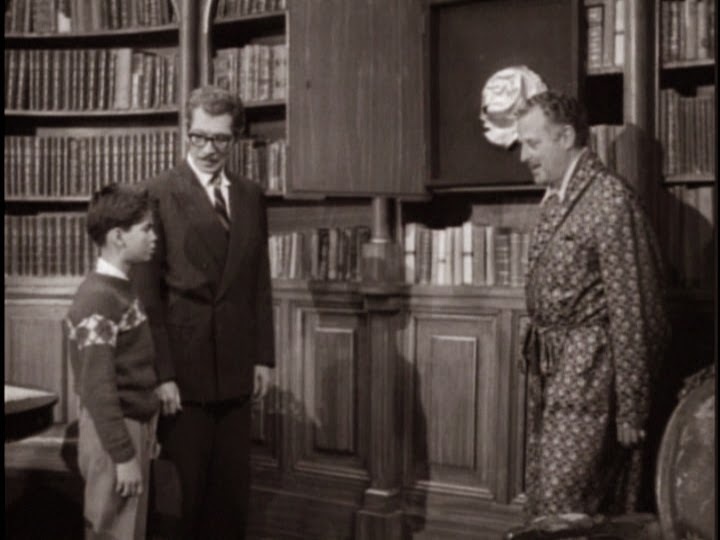 The new Saint is shown his fathers secret laboratory where he once conducted his research and tracking of the bad guys. There's all sorts of devices about the room (which was so secretive, Roberto, for his entire life, was unaware even existed) including his father's invention, the X-Alpha, a wristwatch that acts as a communications device. 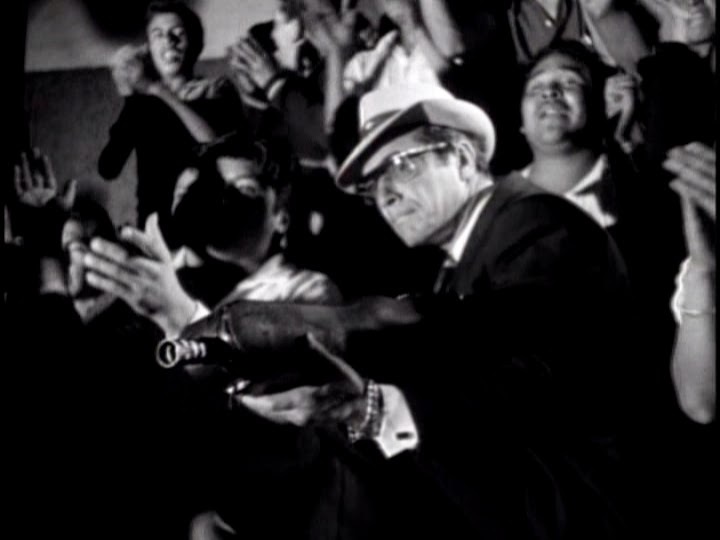 There isn't wall to wall action like in some Santo flicks, but what's here is well choreographed, and unusually brutal. The two wrestling matches in particular are fast-paced and more creative than most. Santo and Fernando Oses give it all they've got in an exciting display of rapid fire maneuvers that escalates into an all-out war in the ring. Even the ref gets clobbered. Apparently there's no disqualifications in Mexico. It gets so intense, blood is even drawn. Both men look like they're really wailing on each other, too. The second, and shorter, but no less vicious match sees Santo take on Max Stromberg (Eduardo Bonada). 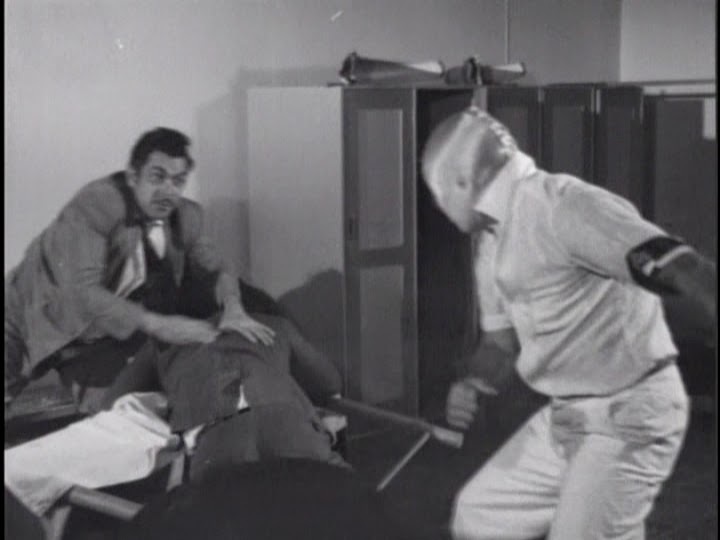 This one culminates with an attempt on Santo's life by an assassin with a sniper rifle hidden inside a guitar case. 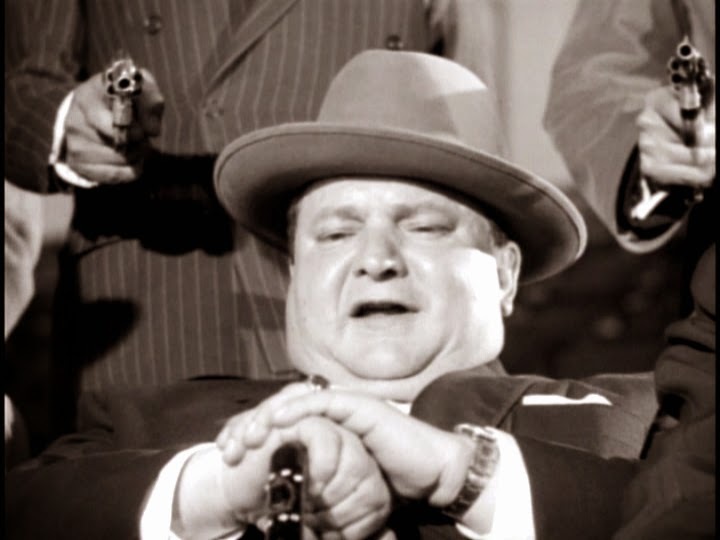 Among the batch of crooks, watch for midget actor Rafael Munoz Aldrete as Cosme's hunchbacked assistant. 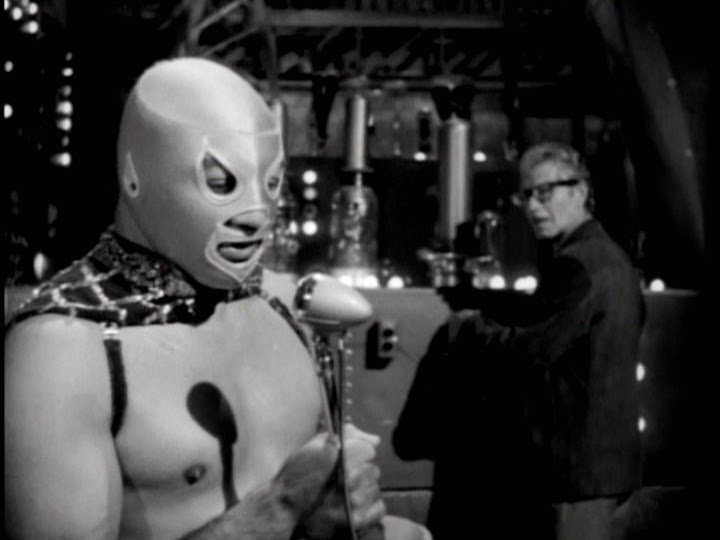 He appeared in similar capacity in the bonkers Santo-Blue action-monster mash SANTO AND BLUE DEMON VS. THE MONSTERS (1970); and he played the Stinky Skunk in the infamous RED RIDING HOOD trilogy released here dubbed from K. Gordon Murray. After a long career in cinema, Rafael died on January 2nd, 2002 after suffering a heart attack. He was 72. SANTO VS. THE KING OF CRIME never attempts to take itself too seriously, and this is clearly in evidence during the climax when the ineffectualness of the bumbling crime king and his cohorts reaches its zenith. 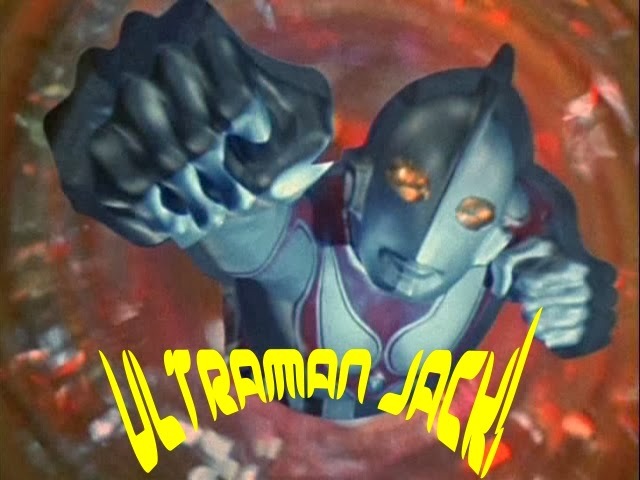 It's a satisfying finale with some touches of humor, and all the Jai Alai scenes justify themselves. 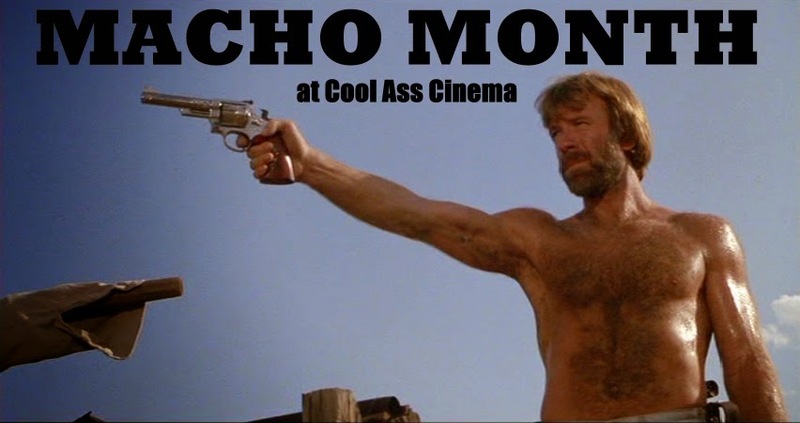 Compared with other Santo actioners without monsters, KING OF CRIME is one of the best of that lot. Some interested parties might be put off by the absence of any fantastic elements, so be mindful of that if you're a fan. 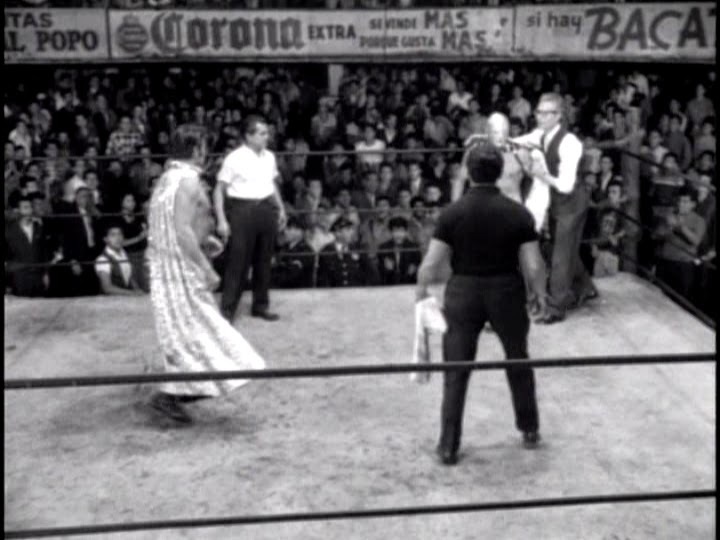 It sometimes feels like it's schilling for the sport of Jai Alai, but the wrestling bouts, brawls, and moderate exposition, not to mention the bonus of an origin for our hero, add up to an entertaining entry in this series of Mexico's most famous luchador. This review is representative of the RTC-Cinematographica Rodriguez DVD. 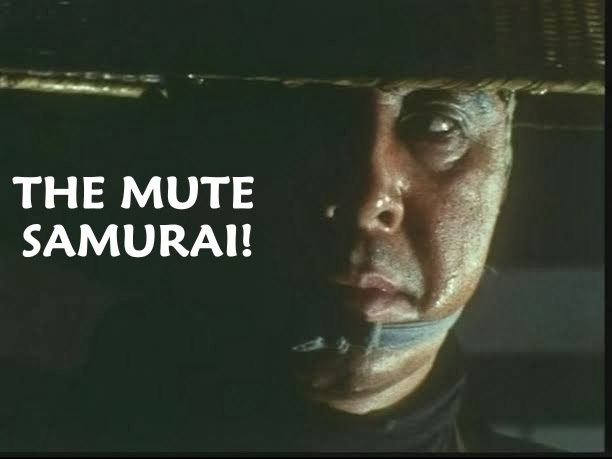 There are English subtitles. Oh man, I'm so ashamed that I haven't seen any Santo films yet. This post has pushed me towards watching my first. Hey Amber! I'd recommend something like SAMSON (Santo) VS. THE VAMPIRE WOMEN, or SAMSON (Santo) IN THE WAX MUSEUM. 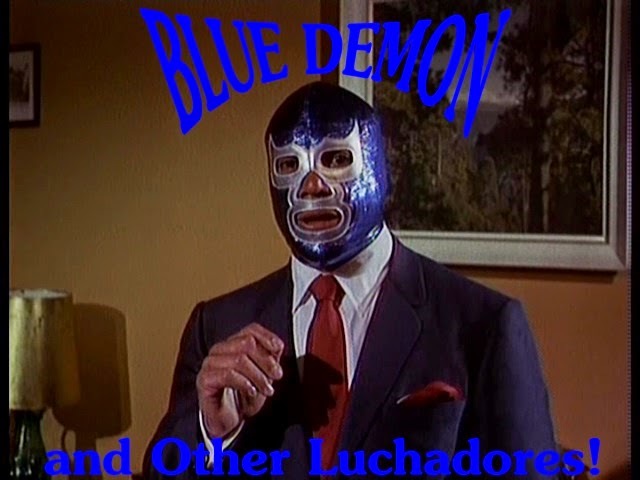 SANTO AND BLUE DEMON VS. 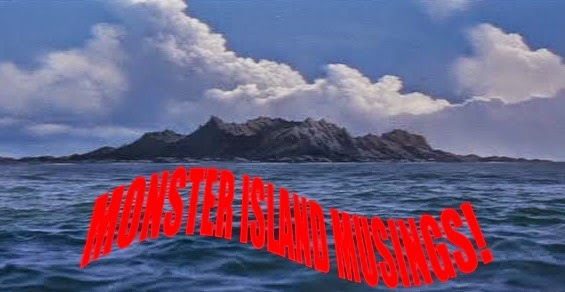 THE MONSTERS is totally insane, though. The B/W ones are more moody and have better production values while the later color ones had this 'to hell with it' attitude, lol.